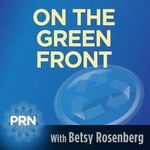 Green Front friends, Susan and Roger Shamel talk about the latest efforts and accomplishments of GWEN, their Global Warming Education Network, on the climate beat. This dynamic duo has come come up with an idea that's gotten the attention of uber-activist Bill McKibben; a State of the Climate Address that President Obama would deliver to get the issue on the American and political agenda. Roger Shamel of the Global Warming Educational Network (GWEN),checks in to tell us about their "Go The Limit" campaign, a CO2 reducing activity that all Americans can engage in - we'll tell you how - and their efforts to get President Obama to issue a "State of the Climate" address. Roger and his wife Susan will also be participating in the Tar Sands protest, continuing outside the White House. Just in time for Mother's Day, Ma Nature is conspiring to get America to wake up and smell the carbon! Between record tornados and flooding that are taking lives, and livelihoods, the conservative dominance in mainstream media talk shows mocking climate activists, and several 'climate converts' sharing their powerful stories on The Green Front, the time has come for all of us to speak up and speak out. Susan and Roger Shamel join me to explain why they went from Republicans not concerned about global warming to founding GWEN, The Global Warming Education Network!